It's been a few months now since I got rid of my home phone, and it just dawned on me that what if there was an emergency? If I called 911 but wasn't able to talk, how would they be able to know where I live? How long would it take for someone to find me? Would I end up dying? I'm sure many people have the same thoughts and looking for an easy solution. I came across a site called Medical Guardian, where they offer an emergency service geared towards people who live alone. It doesn't necisarrily mean that you have to be elderly to have this service... people of all ages would benefit from it. Medical Guardian, was established to provide a reliable and affordable solution to Seniors who wished to live an independent life at home. 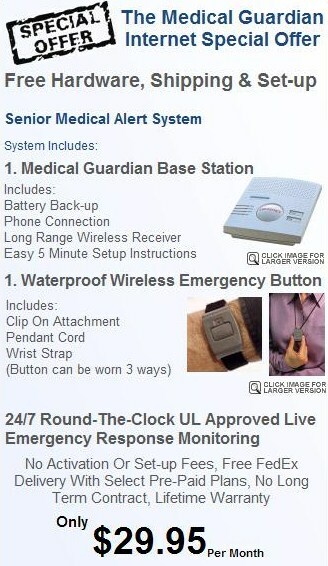 Thousands of American seniors now enjoy a restored sense of independence and their loved ones are comforted in the knowledge that, if ever needed, live and immediate help is just the simple push of a button away. 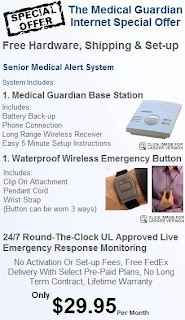 The round the clock monitoring, the top rated equipment and the affordable Monthly fee coupled with no long term contract makes Medical Guardian a smart choice. New follower. Looking forward to hearing more from you!